Would you believe we have only 8 more windows to open, the days have just flown by. Thank you for all your comments, it certainly seems as if the Cuttlebug has a loyal fan base followed by the Fabulous Nesties. Paper crafting has certainly moved on from the old days of Stick Glue and Peel Offs. You have a day off from questions today, you just need to leave a comment at the bottom of this post and check back tomorrow after 00:01 GMT to check whether you have been lucky. Todays window opens to show us this wonderful, sweet card created by the very creative Inge with the Whiff of Joy Teenage Lizzie Stamp. Window 16 was lucky for Jeanette from Happy Thoughts and Inkspots whos No - 27 - was chosen by Random.Org. Hope you enjoy your lovely Christmas Tree stamp Jeanette, can you e-mail us your address so we can get your stamp off to you. What a lovely card! I also inked up teenage Lizzy today! Blessings!! What a wonderful stamp. Absolutely wonderful. These are so gorgeous! I just found your site-- I hope to find some Whiff of Joy stamps offered in the U.S.
Another gorgeous card and a beautiful stamp. Thanks for a chance to win. I love this Card and Image... Today is my Birthday (well tomorrow here in the US).. Hope it brings me some Luck!!! Thanks for the great Inspirations. I have just discovered Whiff of Joy stamps this last month and am SO in love with them. This one looks so much like my daughter, I'm definitely going to have to put this one on my wish list for my next order. Thanks for such wonderful inspiration. I love all the Whiff of Joy stamps, and would be happy with any of them in my rubber collection. I love the coloring on this card! Very beautiful. This card is beautiful. I just love the image and the colors are so pretty. Thanks for a chance. I love this card and although I have this stamp I would love to win a blog candy just once! Wow hard to believe only 8 days left, where does the time go. The card is gorgeous but then again they have all been beautiful cards. Such a pretty card! Thanks for sharing and the opportunity to win. wieder mal eine tolle karte und der stempel ist total süß! wünschen allen einen schönen tag! This stamp is just adorable! And what a beautiful card!! I love the way you connected the card colors back to Lizzie's jacket and gift coloring. Beautiful. And I'd love to be lucky with Window 17 and take Lizzie home. What a pretty card! I'm always surprised by how many different ways the same stamp is colored! Beautiful! Lovely image and fabulous papers and design! The colors used on this card are great and they way her hair is done is amazing! wonderful card. wonderful papers!! Love the stamp!! This is a gorgeous card. Inge always does a fantatic job! And Lizzy is just precious! What a beautiful card! I love the layout and embellishments! And the coloring is very nice, too! I love this stamp! Reminds me of my little girl, although she's not a teenager - she sort of has that Lizzie attitude about her! Thanks for the chance to win! Love the cards! Pretty ribbon tree. This is one jaw-dropping gorgeous piece of artwork!! Gorgeous card. Thanks for the chance to win. Das ist mal wieder eine tolle Karte und ein süßes Motiv. Meine Stempel sind auch angekommen, herzlichen Dank. I love all of the different creative cards we are seeing with these beautiful stamps! Another gorgeous card and a beautiful stamp.Thanks for a chance. Only 8 days til Christmas! This is about when I start to feel like a kid again! Just love it! This is a really fab card, amazing image and colours! eine wunderschöne karte....tolle farben und super coloriert. wow, what a fantastic card from inge!!! Thanks for showing! Gorgeous card,and another fabby stamp up for grabs today. That's such a great stamp and the card is so smartly colored and pretty! Thanks for the chance! Oh nooooo, don't say only 8 more days until Christmas.... The time goes by too quickly and I have too much to do! =) I guess I had better get my grocery shopping done, and get my baking done too. Gorgeous card from Inge. Lovely Lizzie stamp. Another gorgeous card. Haven't got that stamp yet! Oh I really like this stamp too!! And this card is lovely! Beautiful card! I love the way Ingecolours her images. another brill card an a fabby stamp, thanks for the chance to own it. Wunderschön coloriert das süße Motiv und die Papierzusammenstellung ist auch Klasse...eine sehr schöne Karte. Vielleicht habe ich ja heute Glück! Can't believe it's only 8 days to Christmas! What a lovely card the stamp would look great amongst my collection. beautiful card - lovely colours! Fabulous card using my favourite stamp of the moment. I just wish I had it in my stash. This is an absolutely gorgeous card Inge! Thanks again Katharina and Jacqui for the chance to win this stamp. Das ist ja auch wieder eine wunderschöne Karte. Dein Adventskalender finde ich sehr schön, danke das du dir die Mühe machst. Wow,ist die Karte wieder wunderschön! Super schön gestalltet,ein total schönes Motiv und tolle Farben! Another day another lovely card and stamp! Lovely card! I haven't got this lovely stamp yet, so I would love to get it! Sehr schöne Karte! Toll coloriert! Gorgeous card and a lovely stamp. at last! My cards will be finished in an hour or so! Next year I will start in January! And I will leave another comment for a chance too. Yet another lovely card. And a verry wonderfull stamp also on the card. I think I will have no luck, I know! This Stamps is really Lovely today! Here again. :) Great card! Thanks to Inge for a beautyful card, and the motive... love it! I finally got all my cards finished last night. They'll be in the mail today. Hurray! Wow, wieder so eine superschöne Karte, bin begeistert. Einen schönen Mittwoch wünsch ich Euch allen. Such a beautiful stamp and so useful, as it's just perfect for those hard to make teenage cards. Reading Amanda's post can you believe only 8 days until Christmas? So much time and preparation! I hope everyone is also remembering to enjoy this season too! Wow, what a wonderful card :D :D Is is amasing how fast the time is going and that it is only 8 days until Christmas. Wonderful card!! Just one more week and it's christmas!! This is a beautiful card. Love this Lizzy stamp. Oh what a lovely card! I love that stamp! Ein süsser Stempel! Ich freue mich jeden Tag auf die Advents-Kalender-Verlosung...! Wunderschöne Karte, toller Stempel und vielen Dank für die erneute Chance :)! Eine Karte schöner als die andere! Jeden Tag so schöne Dinge im WoJ-Adventskalender zu bestaunen. Das macht so viel Spaß. Vielen Dank dafür! These stamps and your cards are all so lovely. It's no wonder your blog is getting so much attention. A very beautiful card. I love the colours and the composition! Oh, O love this card, it is beautiful. beautiful card. teenage Lizzy is adorable ! 8 days till Christmas...glad I am done with all the shopping !! It's coming too fast for me! Such a beautiful card she's created! These stamps are too cute for words. Beautiful card! This is such a lovely image! I love this stamp, it is so cute! I think my daughter would especially like it. Thank you for the chance to win it. Was für eine wundervolle Karte!!! 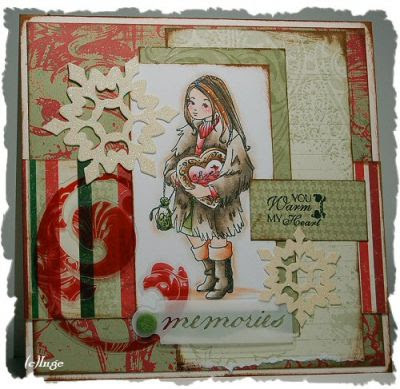 Gorgeous girly stamp and wonderful creation too. thanks for this event! What a beautiful card! Thanks for this chance to win! I think the teenage lizzie is one of my favorite ones! I so wish I had this one, but alas .... I dont think I'll ever get her heart! Ahhhhh, to love stamps! Your card is beautiful .... wishing you a great 8 days til Christmas. Oooo, I love this stamp! The card is beautiful. I can picture my baby girl looking like that in a few years. AHHHHH I am not even done with all my cards yet. Lovely card again. Such a lovely card, I love the colors and softness of this card! ich bin wieder mal begeistert! This card is beautiful. I just love the image and the colors are so pretty. Thanks for sharing and the opportunity to win. This is so much fun, seeing what's behind the window each day. Fingers crossed! Stunning card today. I love the colors used Inge. Thanks for the chance to win. Love the card - and the stamp. This is such a cute stamp. Thanks for the chance to win it. Beautiful card with a wonderful stamp. I have my fingers crossed again - thanks for playing Santa! auch ich möchte heute mal wieder mein Glück versuchen. Die Vorweihnachstzeit vergeht immer so schnell, dabei ist es doch irgendwie die schönste Zeit des Jahres. here's my comment - I am still trying!!! ha ha!! This looks like a lovely stamp - one that could be used for more than just Christmas things. Was für eine süße Karte, ist ja klar bei diesem Wunderschönen Stempel. Beautiful card, love this image. I'm hoping someone gives me some money for Christmas & I'll be able to start my WOJ collection. 8 days till Christmas! Where has the time gone? Your stamps are so beautiful, I can't wait to get some. It will have to be after Christmas b/c I'm super broke=0) Thanks for your beautiful blog and stamps! Oh only 8 more days....woo hoo, can hardly wait, as that means I get to play with all my new crafting goodies I'm sure to get. Really like this stamp too, it would look fab in my collection. What a beautiful card. I don't have the teenage Lizzy stamp yet...hoping to add her to my collection soon. What a lovely card and i have to say - Iam so enjoying the little extra sentiments below the cards in your posts they add a warm touch. What a beautiful stamp! Lizzie is so pretty with her long hair, she reminds me of my daughter who has hair down to her waist. I love the little hearts you added to the stamp. Hearts are my favorite. Hugz! This is a wonderful card too! Love it!